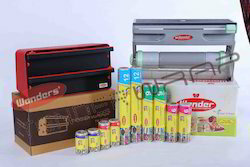 We are a leading Manufacturer of multi utility dispenser, multi utility wrap dispenser, cling film dispenser 12 inches, cling film dispenser 3 inches, cling film dispenser 4 inches and cling film dispenser 6 inches from Delhi, India. 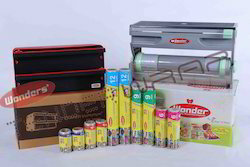 * HOME: General home food protection, such as fruits and vegetables, basket, bread, sandwiches, biscuits, Salads, etc. * ARCADE: Hotel, Non-veg products, Fish Shops, Fruits and Vegetables Shops, Bakery, etc. * INDUSTRY: Automotive, Electronic, Electrical, Industrial and other type of products requiring surface protection. 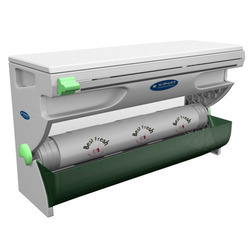 * HOSPITAL: Covering/Wraping of cut Fruits and Patients Diets, Protects from Flies and insects. *For use as hygiene and protective cover for foods and other persihable items in households, hotels, hospitals, Laboratories, food stores and other outlets. *Keeps baked/cooked food, Fruits and vegetables fresh and clean for long time. * Overwrap and protects food item. fruits and vegetables. * Better Mechanical properties, tear resistant. Looking for Cling Film Dispenser ?